A few words to explain what I plan to do with this website and why I finally decided to start this work. These pages are decicated to POV-ray , the well-known raytracer. Since a few years I used to set up scenes with POV-ray, nevertheless I'm still a beginner. I noticed that it's really not easy to understand how POV-ray is handling with light. So I started some simple "experiments", spending hours on the internet looking for information. Finally I plan to use these pages to start again very simple examples (with the source code and calculated images). Related to this examples I will post some questions in the official POV-ray. Since english is not my mother tongue I appologize to all of you how are tired of reading this charabia...! I promise I do my best! These are the basic elements we are going to consider for the first "experiments". 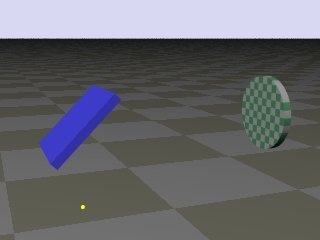 We have a light source, made "visible" as a small yellow sphere using the "looks_like" function. The beam is directed toward a solid with a surface tilted by 45 degrees. The material of this solid can be "visible" (blue texture) or reflective (mirror) by choosing the appropriate material. Finally there is a disc "screen" textured with a green and white checker. We have two cameras, the first one is used to view the whole scene and the second one (not active for the moment) is positioned just in front of the screen. Part 1 - The first part is dedicated to light sources, objects and media.